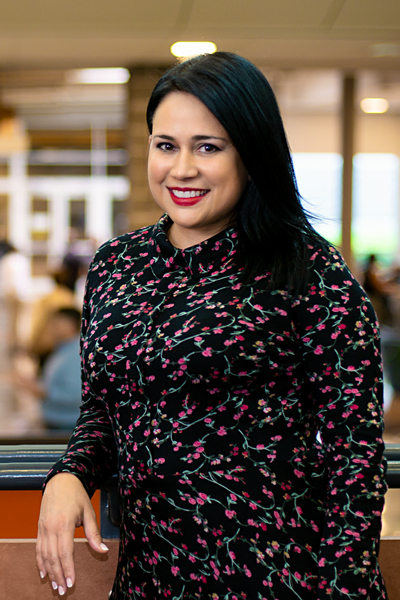 Mariely Bandas-Franzetti utilizes her role as the vice president of global services at Dell to encourage Latinas and women as a whole to pursue and succeed in STEM careers. Bandas-Franzetti’s interest in STEM was sparked when she was a little girl, living in Puerto Rico, watching her father almost every Sunday take apart his 1968 red Camaro. While putting the classic back together, he would explain to his youngest daughter the technical logic of how machinery works. The father of three was born and raised on the island and sacrificed a lot to put himself through college to become a mechanical engineer. He continuously taught his daughters, she says, to focus on their education, self-reliance, and independence, and he ensured that they received an education so they could be independent on their future journeys. At the age of twenty-one, after graduating from Universidad de Puerto Rico in 1996, Bandas-Franzetti put her degree in industrial engineering to use by relocating to Austin, Texas, for a job opportunity with IBM. “I moved alone and didn’t know anyone,” she says. “I made that decision just for experience.” Initially, her plan was to work in the United States for just two years. One mentor in particular taught her the biggest lesson that she’d ever encounter—a lesson that would push her out of her comfort zone and help lead her to her current role: vice president of global services under the Dell Digital organization. “She told me, ‘I need to ensure you’re ready to change to a new job area where you’re not the subject-matter expert; your next development opportunity is to manage an organization that is global in scope, requires team development and is in an area where you are not established as an expert,” Bandas-Franzetti says. That eye-opening, development opportunity helped her focus and develop the people skills needed to oversee an executive team. “That was my biggest experience: having a leader see potential in me for the next challenge—or challenging me to get out of my comfort zone” she says. In her role, Bandas-Franzetti oversees a global team of professionals that support development, deployment, and sustainment of IT solutions. Her responsibilities are to work closely with Dell’s internal business partners to drive business transformation and innovation to more efficiently and effectively serve Dell Technologies’ customers. To promote STEM within Latinas and women altogether, Bandas-Franzetti does a lot of championing internally and externally with Dell’s employee resource groups (ERGs). With the Latino Connection ERG, she is helping to build the pipeline for external leadership engagement with the Hispanic Association of Corporate Responsibility (HACR) and is involved with HACR’s Young Hispanic Corporate Achievers Program. With Latinos in Tech, Dell brings in synergies from across many ERGs in the Austin area to drive common Latinos development initiatives. Bandas-Franzetti also partakes in recruiting events with the Society of Hispanic Professional Engineers. Her mission to help others doesn’t stop there, though. This year, Bandas-Franzetti created and launched a new program called Women in Leadership, which is designed for Dell’s female employees. The yearlong program hosts workshops and lectures with the key purpose of inspiring, encouraging, and supporting women to reach their full potential. “I’m very passionate in helping females identify unconscious mistakes that may impact their career development and how to avoid career pitfalls overtime,” she says. In 2019, the first thirty employee participants will be graduating from the program, which kicked off in Brazil and is expanding to other Dell Digital locations. As another driver to seek women talent, Dell recently launched the ReStart Program. The program is a STEM Re-Entry Task Force initiative led by the Society of Women Engineers (SWE) and iRelaunch to increase the number of women in the STEM industry by providing support to those returning from a career break because of personal or family reasons. Dell is a member company and will be hiring under this program. When reflecting on her two decades with Dell, Bandas-Franzetti sees a company with talented people, a noble mission, and a well-founded strategy. Mariely Bandas-Franzetti is a three-time recipient of the Hispanic IT Executive Council (HITEC) Top 100 award: 2017, 2018, and 2019.